HomeThe Spirituality of Gothic Architecture: Look Waay Up! G K Chesterton, that famous penner of pithy wit, once remarked that some moderns were saying that Gothic architecture, with its towers and spires, was naught but a collection of phallic symbols. He challenged his opponents to build an upside-down cathedral. It’s impossible. 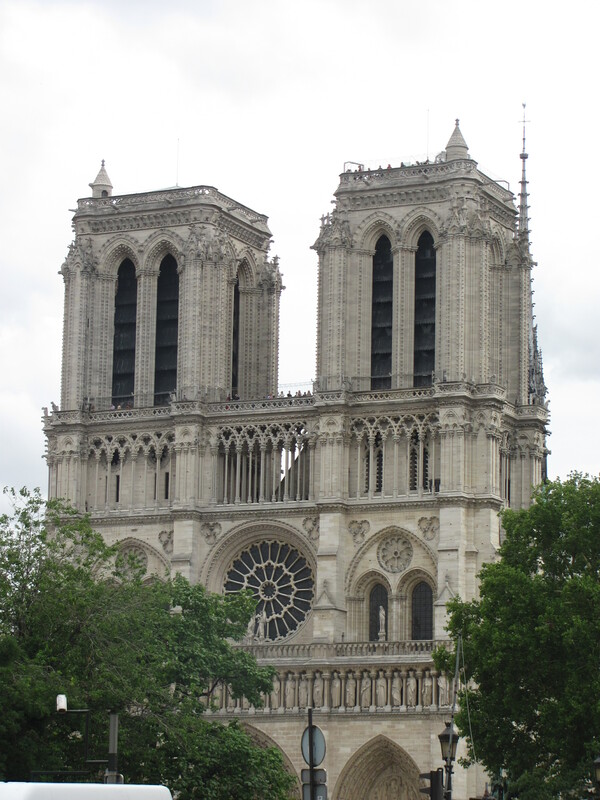 Gothic architecture, he maintained, looks the way it does because that’s the most practical way to build a tall building – wide at the base, and skinny at the top. Furthermore, may I add, the height is not there to make you think of penises. I’m sure this will come as a shock to many of my readers. But it is true! The height is there to draw your eyes heavenwards. To lift your gaze up and up and up. The sky is the heavens, and throughout the New Testament, the rule of God is referred to as the Kingdom of the Heavens. This metaphor is therefore actualised for us by the architecture of Gothic churches and cathedrals. 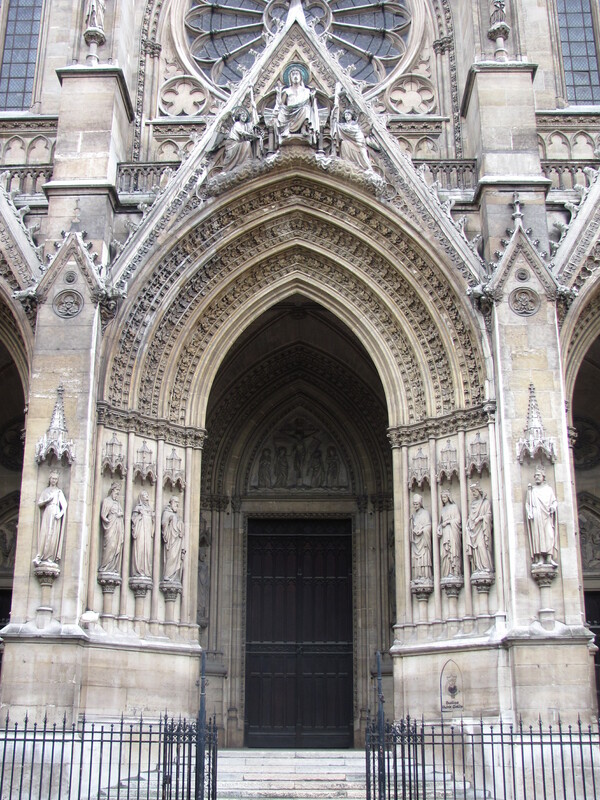 Gothic architecture, you see, is designed to draw your eyes upwards. This is what I have always been told, at least. I have also been told that it is in contrast to Classical architecture and the Romanesque edifices that follow. 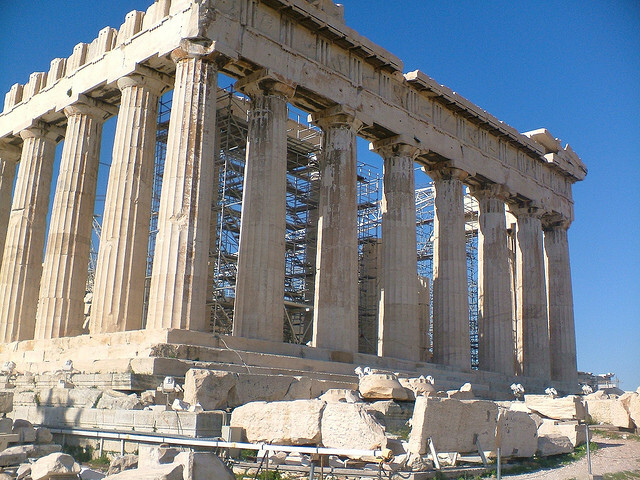 Classical architecture, so beautifully achieved in the Parthenon or the Arch of Constantine, is an achievement of balance, of poise, of precise, human order. Gothic architecture is also balanced. But you don’t look at it and say, ‘How geometrically precise!’ Indeed, take a look at Notre Dame de Paris, one of the most famous Gothic buildings on earth. You look at it and you say, ‘Wow, there’s a lot going on!’ And then, inevitably, you end up looking at those high towers with their loud bells between which Philippe Petit once walked on a tightrope. I’ve been told that it’s a result of the points on the arches. The viewer can’t help but keep moving the eyes upwards. I don’t know if any of this is true. All I can say is that it happens to me every time I visit a Gothic cathedral. Take, for example, Notre Dame again. I was recently there during Mass for the Assumption of the Blessed Virgin Mary. I spent my time walking through the arcades and ambulatory. The columns are your usual compounded columns of Gothic architecture. And I couldn’t help looking up. I even have the video to prove it. The eyes rise up and up until they hit the ribs and the arches and the groin vaults. It’s not their fault. Blame Pierre de Montreuil. Once a Gothic church has stolen your eyes, it takes them on journeys of its own choosing. In Milan, you find the pillars topped by sculptures of saints and martyrs. The faithful are ever with you. At Notre Dame, you find Corinthian capitals (a bit of a yawn after the amazing Romanesque capitals in the crypt of St. Denis, that include a guy hitting the devil with a stick. But you also find rose windows. As mentioned in the previous post, rose windows are part of the achievement in Gothic architecture in making space for light to transform the liturgical space. 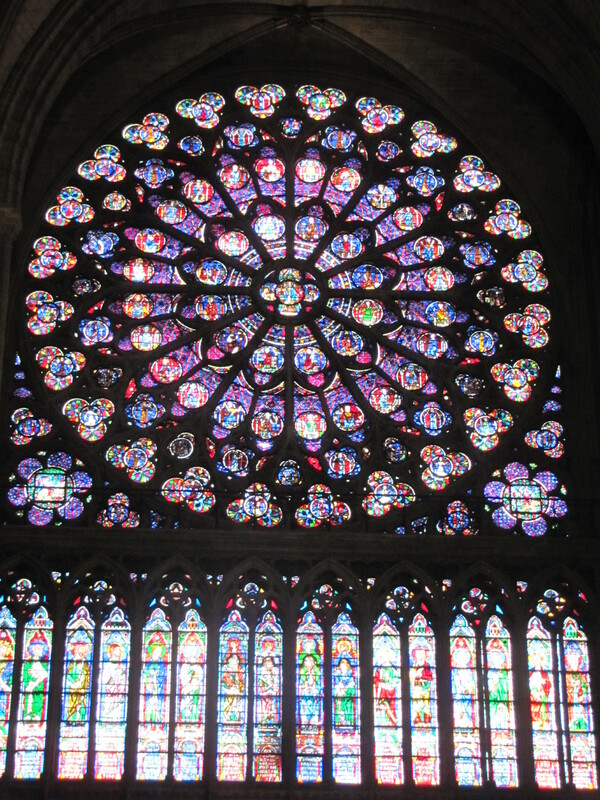 The first of Notre Dame’s rose windows that I saw, in the south transept, is known as the Rose du Midi. In the centre of this window is Christ as depicted in Revelation, a sword protruding from his mouth. Images of the New Testament stories fill the rest of this rose window as well as 16 prophets who have the four evangelists resting on their shoulders. Your eyes have been drawn upwards, and what do you find? You find Christ, his judgement, and his kingdom. He is the Light, symbolised in the physical light streaming through the rose window that illuminates the icon of the King of the Universe in the centre of this window. The central reality of the mystical theology of the whole Middle Ages, from before Pseudo-Dionysius to the early modern Carmelites Sts. John of the Cross and Teresa of Avila, is the ascent to and discovery of God. Having encountered Christ, the contemplative can have a union with him, can contemplate the reality of the Holy Trinity, something that the fourth-century mystical master Evagrius argues is the height of Christian living. We have, whether by simply being created matter or through the Fall, gone away from God (exitus). It is now time to return to Him (reditus). Our spiritual eyes must ever stray upwards, up to infinity and beyond, into the starry heights. Somewhere out there, for the mediaeval believer, God was animating the Primum Mobile, and everything was moving and existing out of love for the Divine – this is the central reality of Dante’s Divine Comedy and the heart of Cistercian spirituality as demonstrated in the works of St. Bernard of Clairvaux (Saint of the Week here) – authors who frame the world of Gothic cathedrals (read this on their relationship). Another theologian of the Gothic world was St. Thomas Aquinas. As mentioned before, Aquinas emphasised the theme of exitus-reditus in his Summa Theologiae. We are to return to God, the true source of all of our happiness and real joy. This is to be done through moral living, through following law, through studying Scripture. And at some point, Aquinas had a mystical experience whilst celebrating the Eucharist. After this, he never wrote another word of the Summa. Many take this fact as a pointer to the direction our own spiritual gaze must go – we are to turn our sights away from the earthbound reason of intellect and transform our nous, our soul, through spiritual insight and contemplation of the divine. I, personally, believe there is room for both approaches, for the reasonable and the contemplative, for the apophatic and the cataphatic. And there is room for both visions of exitus-reditus in the cathedrals of Europe. 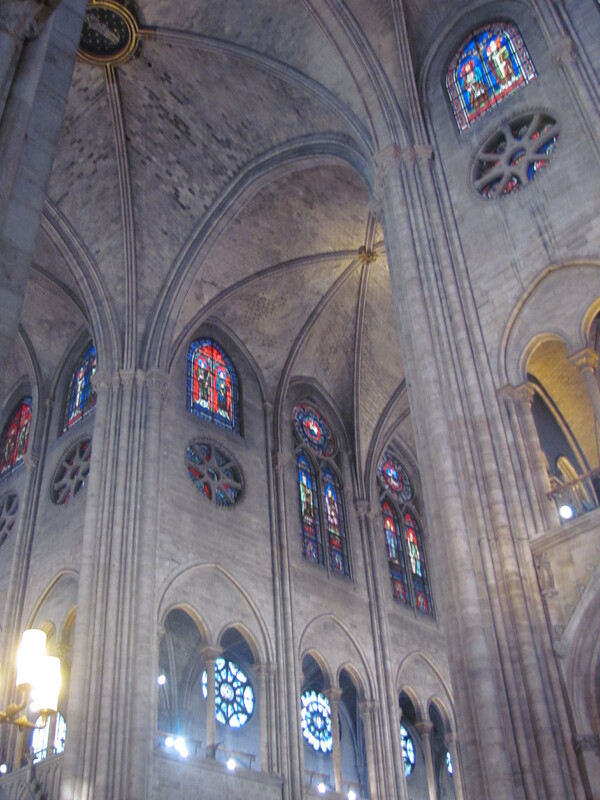 We come to these majestic Gothic cathedrals and look up, up, up. 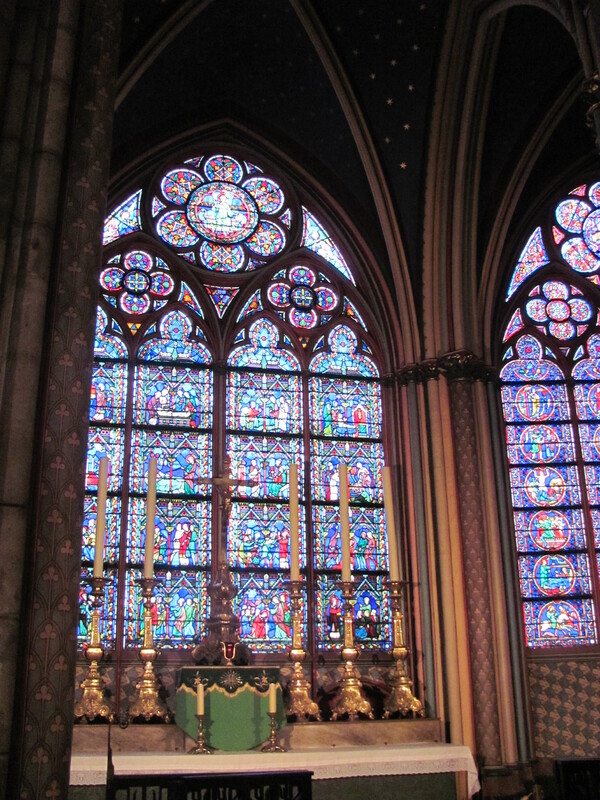 There we can perceive the carvings and the architecture, we can perceive the images of the stained glass. Yet to see stained glass clearly, there must be the darkness around us. And often, a rose window is too far away to discern properly. We are in the presence of truth but unable to properly conceive it. So, very often, with God. And, like inconceivable Gothic stained glass, God is beautiful above all. ← The Spirituality of Gothic Architecture: Fiat Lux! BTW, have you read “Notre Dame de Paris” by Victor Hugo? He has an interesting interpretation of Gothic architecture, and a not so flattering view of the Church. The story of Aquinas’ mystical experience is in Aquinas’ Summa Theologiae: A Reader’s Guide by Stephen J Loughlin, which I just read; it is also in various books on mysticism, including at least one anti-Thomist Orthodox book that uses it to try to argue that reason is completely useless in the face of the Almighty. I do not know the mediaeval reference for it, though. It seems to me that whoever “argues” against reason is not thinking straight. Because when they argue, they use reason, and thereby proving that reason is useful, even indispensable, in establishing truth. If so, why can reason not be used in the pursuit of the ultimate Truth? My appreciation for Gothic architecture was born when I entered York Cathedral almost ten years ago. While wandering around and being lifted to heaven in my soul, I fell into what I would have to call an ecstasy of joy. At the same time, I was frustrated by my inability to contemplate at leisure the high places where my eyes wanted to travel, by the necessary craning and straining of my neck. It occurred to me that the ideal way to tour the cathedral would be in a reclining wheeled chair, with a knowledgeable guide pushing me around. He or she would not be one of those chattery docents who never stop talking, but someone who would answer my questions thoroughly but be silent otherwise. You would be perfect for the job! In light of recent events, I thought this worth a re-post. Enjoy.